This shop has been compensated by Collective Bias, Inc. and its advertiser. 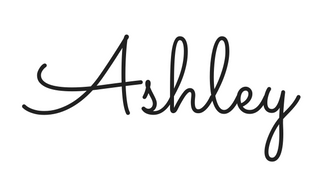 However, all opinions are 100% my own and I do not feature products that I do not truly love and support. The trust and support of my readers are always my number one priority. #BioreFizz #CollectiveBias. Your nighttime skin care routine is extremely important in that it can greatly influence how good your skin looks and feels. 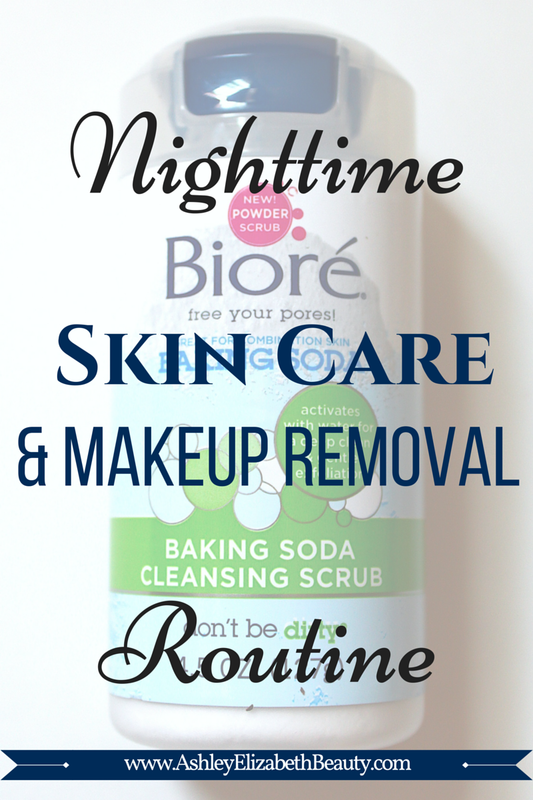 It is important to remove all makeup, cleanse thoroughly, and moisturize daily. Taking care of your skin FIRST is beauty rule number one! Recently on my weekly excursion to Target I came across two new products from Biore that were so unique I knew I immediately wanted to include them in my nightly skin care routine. I was excited to try the Baking Soda Cleansing Scrub and Baking Soda Pore Cleanser because the ingredients looked like they would mix well with my combination skin. 1. Remove makeup with makeup removing cream or wipes (depending on what you have), and stubborn eye makeup with makeup removing oil. 2. 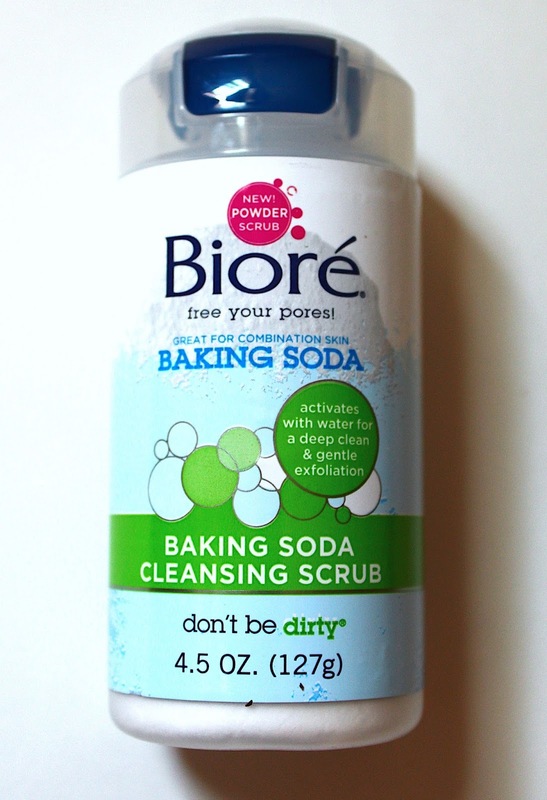 Clean the face with Biore Baking Soda Cleansing Scrub, perfect for combination skin. 3. 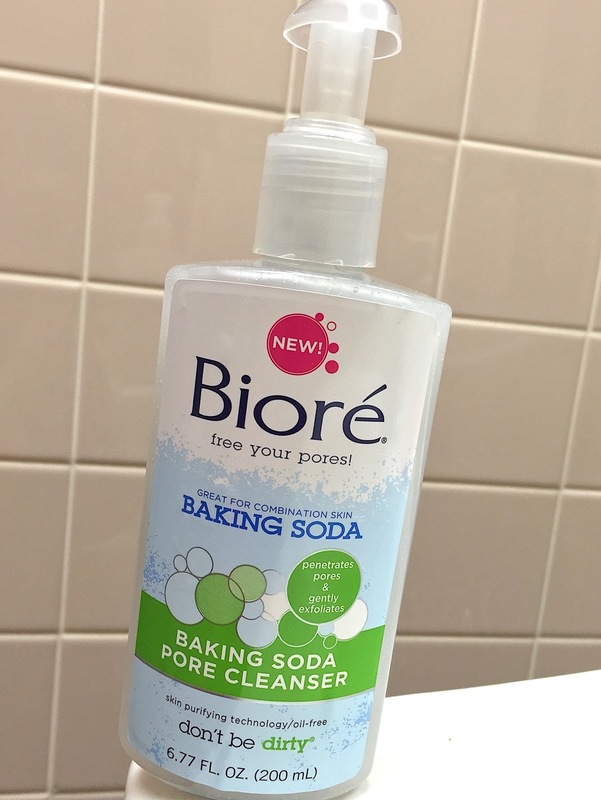 Deep clean pores with Biore Baking Soda Pore Cleanser for super clear skin. Also perfect for combination skin! 4. Moisturize with hydrating a face lotion, anti-aging cream, and eye cream. Biore's Baking Soda Powder Scrub is perfect for cleansing combination skin. 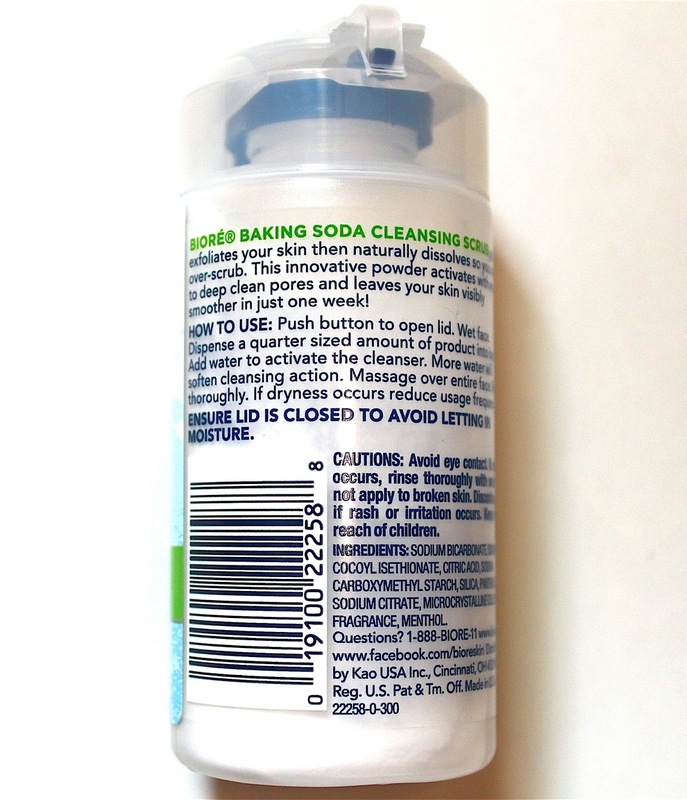 I find that my skin is oily during the summer and dry during the winter, and this Baking Soda Cleansing Scrub is great for year-round use. I saw results within my first week of using the scrub. My face felt extraordinarily refreshed and clean, even after an entire night's sleep. 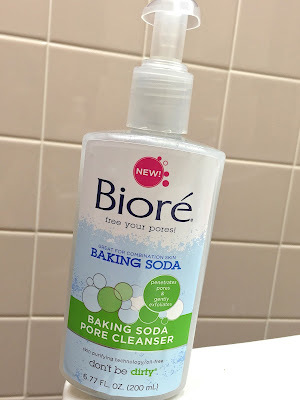 When I first purchased this product I was intrigued by the idea that is is actually a powder that activates with water instead of a pre-made solution. It naturally dissolves so there is no chance I can over-scrub my sensitive and delicate skin. The smell is so good and natural, not chemically, and makes me feel like I am actually applying something good to my face. 1. Wet face with lukewarm water. 2. 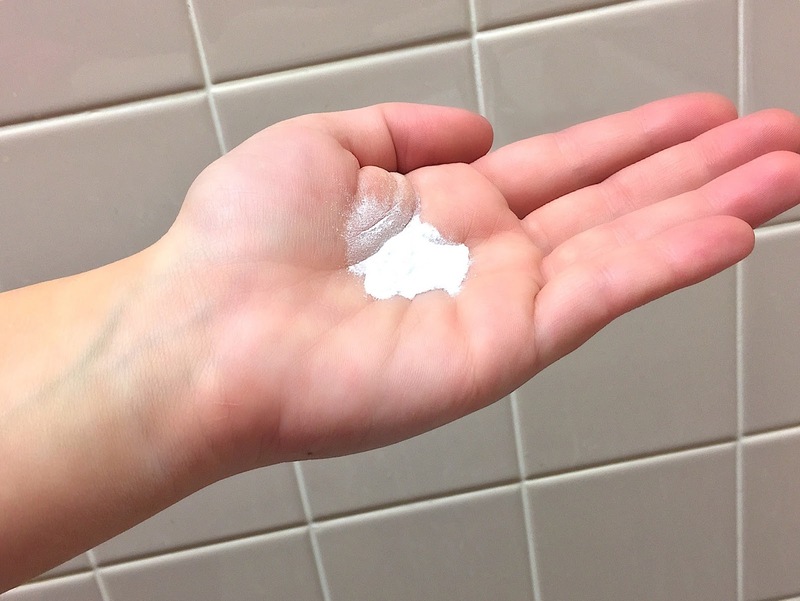 Dispense a quarter sized amount of the powder scrub in the palm of your hand. I love the lid function on this product; the push button avoids letting moisture into the bottle, keeping it fresh for every use. 3. Add water to activate the cleanser and make it fizz! More water will make the cleanser more gentle, giving you complete control over to decide what works best for your skin. 4. Massage the scrub over the entire face, which will provide the skin with a deep clean and gentle exfoliation. 5. Rinse face thoroughly with lukewarm water. 6. Pat skin dry and proceed with normal moisturizing routine. A (rare) no-makeup selfie after a thorough night cleanse! 1. Always follow a deep clean with a moisturizing face cream, even if you have oily or combination skin! 2. After cleansing make sure to pat dry your face with a new, clean and gentle face or hand towel. One of the best ways to ensure you are not spreading oil, germs or other bacteria around your face is to always follow this step. 3. Make sure you are choosing skin care cleansing products that are correct for your skin type, but don't be afraid to experiment! 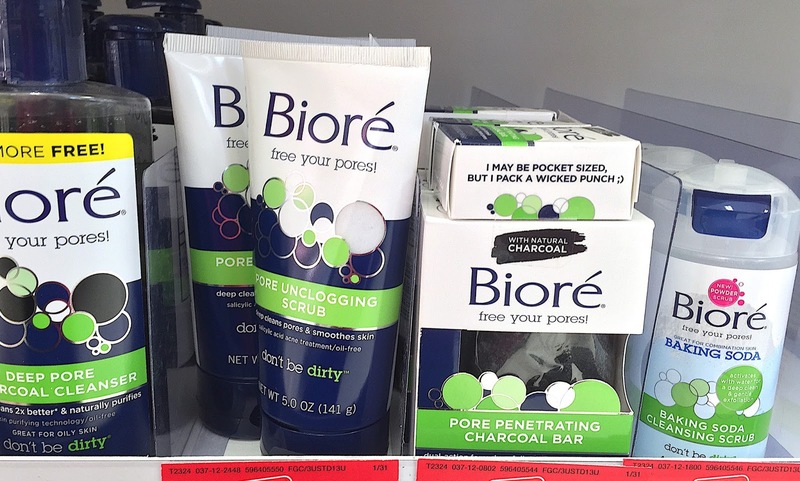 If you find that your skin is more oily and less combination, I have loved using Biore's Charcoal Products during the summer months when my skin is extra oily. Every skin type is different, and it is fun to explore new products and see what works best for you! 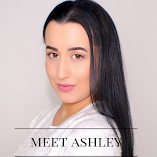 Interested in MORE Skincare Product Reviews? Check out my YouTube!